How can we make agricultural practices more sustainable? How will we adapt food production to warmer, dryer conditions? How can we conserve biodiversity and natural resources while meeting the needs of growing populations? These are among the most urgent questions of our time, and ones that at EARTH are inspiring our students, faculty and alumni to uncover answers and develop innovative approaches. In our latest Strategic Plan we have set forth a goal to strengthen our research capacity. To this end, EARTH’s Research Unit, under the leadership of Professor Luis Pocasangre, is already working to build international and regional research consortia with strategic partners to improve the quality of research and access public funds. 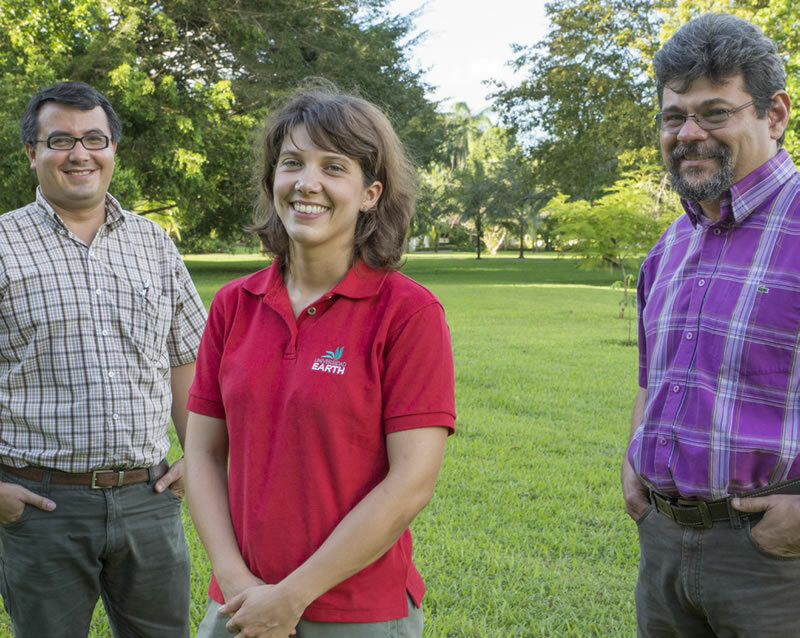 We also see great opportunities at the EARTH-La Flor campus for conducting research on climate change adaptation in agriculture and are exploring possibilities for joint research at that campus with the International Center for Tropical Agriculture (CIAT). Already at La Flor we are engaged in a joint project with Ad Astra, Cummins, the Costa Rican Ministry of Environment, Energy and Telecommunications, and the Costa Rican Oil Refinery (RECOPE) to determine the feasibility of using methane generated from waste, and hydrogen generated from renewable sources for the production of electricity. Apart from helping develop solutions to some of the greatest challenges facing humanity and our planet, we know that by involving students to a greater degree in applicable research, we are preparing them to be life-long learners, to innovate and test new approaches for the benefit of society. When we think about food, we rarely think about dirt, even though the soil surrounding a plant’s root system is where the majority of its biological and chemical activity takes place. This is why professors and students at EARTH are focusing their attention on the rhizosphere. Recent research at EARTH in soil and root health on commercial and organic banana farms showed that the necrotic index (percentage of non-functional roots) in organic systems was just 17% compared to 25% on conventional farms. 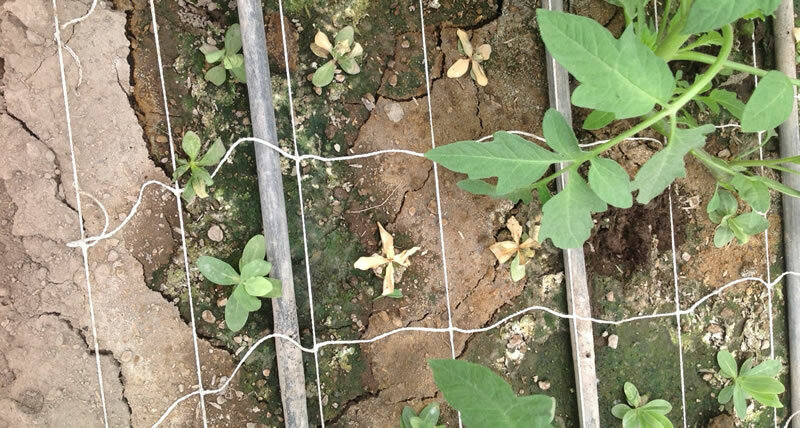 In addition, populations of parasitic plant nematodes (microscopic worms that damage root systems and cause crop-loss) were three times higher in conventional plantations. However, what really excites EARTH Research Director and banana crop specialist, Luis Pocasangre, is that Radopholus similis (R.Similis)—one of the most destructive nematodes—was the predominant nematode in conventional plantations, but hardly present in organic plantations. Bottom line: “Healthy soils have a balance of biological, physical and chemical properties. This balance is found in natural conditions, where soils have not been disturbed by pesticides,” explains Pocasangre. 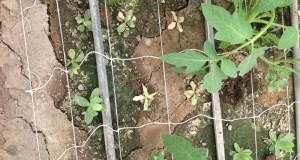 Another research project at EARTH showed that on a new plantation where the land had been fallow for three years, R. Similis was not detected for two years and when the nematode was detected, the populations remained low for three years—partially thanks to the application of organic compost. Root systems are also healthier: just 9% necrotic index compared to 46% on old plantations. In addition, in soils where the farmers are not applying pesticides, the population of plant parasitic nematodes is zero or very low. Bottom line: Crop fallow is a key factor in maintaining soil and root health; and organic compost reduces soil pathogens. Raysher Foster (‘13, Costa Rica) knows bananas well. He grew up surrounded by commercial banana plantations near EARTH’s Guacimo campus. With the hope of finding ways to reduce the application of chemicals on banana plantations, Raysher traveled to Brazil during his third year internship to conduct research in the subtropics of Corupa, Santa Catarina. His findings showed a close correlation between root health and the vigor of banana plants. Bottom line: Fewer chemicals make for healthy soils, which ensure healthy root systems and more productive plants. Help us continue our critical research in sustainable agricultural practices with a gift to EARTH today. 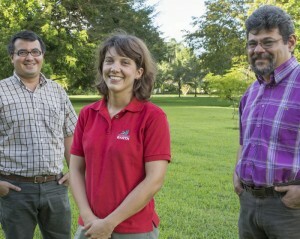 In the early months of 2013, we welcomed three new permanent faculty members: Rebeca García (Spain), professor of Waste Management; Argenis Mora (Venezuela), professor of Basic Mathematics and Calculus for the Agricultural Sciences; and Santiago Vélez (Ecuador), professor of Entrepreneurial Projects. Rebeca, who holds two Masters in Environmental Sciences and Renewable Energies, most recently worked as an education officer at the Valdemingómez 2000 Waste-to-Energy Recovery Plant in Spain. Aregenis, who holds a Ph.D. in Tropical Agro-forestry and a M.Sc. in Statistics, brings more than 15 years of teaching experience, most recently as a tenured professor the University of the Andes, Venezuela. Santiago, who holds a Ph.D. in Strategic Planning and Leadership and a Masters in Agricultural Business Management, comes to EARTH from the Inter-American Institute for Cooperation in Agriculture (IICA) where he was an agribusiness consultant. 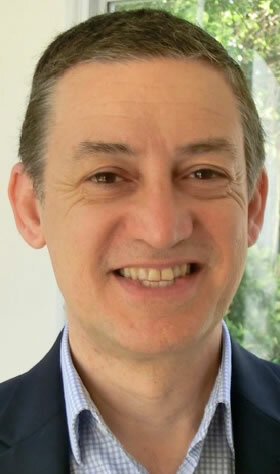 In its March 2013 meeting, the Board of Directors elected four new members: Mr. Abdallah Alaoui (Morocco), senior advisor to Cummins Africa and former President & CEO of the MIFA Group; Ms. Anne Slaughter Andrew, departing U.S. Ambassador to Costa Rica; Mr. Francis Durman Esquivel (Costa Rica), CEO of Durman Esquivel PVC; and Mr. Olav Kjørven (Norway), Assistant Secretary-General and Director for the Bureau for Development Policy at the United Nations Development Programme. “We are honored that such distinguished individuals have agreed to donate their time, experience and resources to ensuring the continued impact and relevance of EARTH,” remarked Board President, Mr. Tim Solso. On the evening of February 13 at the Organization of American States, more than 250 people joined us to celebrate EARTH’s efforts to cultivate a more peaceful, prosperous, and just future through education (visit www.earth.ac.cr/support-earth/one-night-one-earth for photos of the event.)). Thanks for helping making this event one of the most successful in EARTH’s history! 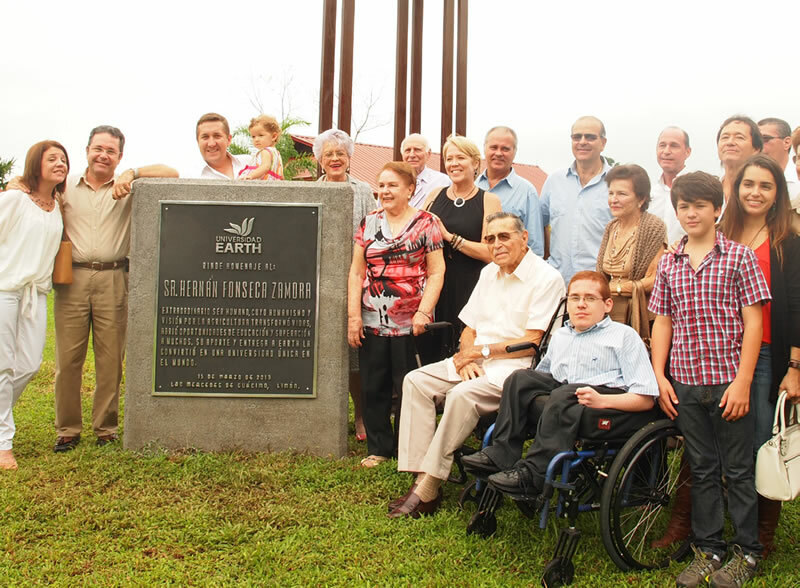 On March 15, EARTH University paid tribute to one of the Institution’s founders, Mr. Hernán Fonseca Zamora with the unveiling of a sculpture in his honor called “Flight,” by the Costa Rican artist Esteban Coto. Mr. Fonseca, who passed away in 2011, served as a member of EARTH’s Board of Directors for 20 years from 1989-2009, holding the presidency for three terms, and later as emeritus director. During the unveiling ceremony on the EARTH University campus in Guácimo, Mr. Fonseca was remembered for his exceptional qualities as a human being, his leadership in building a more just and prosperous Costa Rica and his commitment to the fulfillment of EARTH’s mission. We warmly thank Mr. Fonseca’s many friends and colleagues who in honor of his legacy generously donated the funds required for the monument’s construction. During the weekend of June 1 and 2, the annual Tropical Americas Fair will be held under a new name: EARTH Multicultural Fair. Students organize this annual fair to raise money to bring at least one family member of every graduating student to the commencement ceremony in December. The new name better represents the growing cultural diversity of the EARTH community, which now includes students from 33 countries in the Americas, Caribbean, Africa and Asia. As always, the fair will be held on the Guácimo campus and will offer cultural activities, traditional foods and entertainment from more 30 countries. June 1 – 2: EARTH Multicultural Fair (EARTH Guácimo campus). June 5: World Environment Day and Day without Cars (EARTH Guácimo campus). July 3: Los Hijos de la Tierra Day (Institutional tree planting and volunteer day). 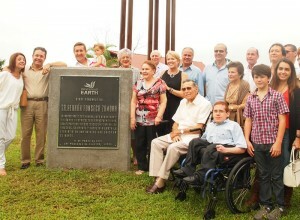 July 3 – 6: Amigos trip to EARTH campus. July 25: Costa Rican national holiday (EARTH campus closed). August 2: Eco-Romería (San José-Cartago, Costa Rica) and Costa Rican national holiday (EARTH campus closed). August 15: Costa Rican national holiday (EARTH campus closed). August 25 – September 8: Student vacations. September 9: Start of the third trimester 2013. September 25 – 28: Amigos trip to EARTH campus. EARTH University is dedicated to finding innovative ways to protect and improve our world. Contribute to our research programs. If anything has tested David Revelo (‘09, Ecuador), General Manager of Agroinnovación, it has been the specificity and selectivity of pathogens, as each one requires personalized treatment. After graduating from EARTH, he worked at Hilsea Investments Limited, a grower of roses and summer flowers. His first position was as leader of ISO Integrated Pest Management (IMP) where he was in charge of ISO certifications and infestation management. From there, he went on to temporarily run the floriculture research unit. After analyzing the performance of the lab and studying the market opportunities, David proposed offering biological controls to other flower producers, and not just to the farms that belonged to the company. Under David’s guidance, Agroinnovación was born. This research and development laboratory produces specialized bio-controls and plant diagnostics for the flower industry. Just like a medical exam, they first perform a diagnostic in the field to identify the pathogen and then review the soil itself to see if it contains the cure. If not, they analyze whether fungus strains at Agroinnovación can help to attack the disease. “We look for a unique bio-control strain for the farm that can be collected from the forest or from another farm. That’s what makes our work so exclusive,” explains David. With 13 people to manage, this graduate leads the lab with a big dose of creativity and innovation. His biggest achievements include the modernization of bio-control production, a 40% reduction in the use of agro-chemicals for disease treatment, and the adaptation of technologies like bio-digesters to produce bio-fertilizers. “My biggest contribution has been to help my colleagues see that these things do work; that we can be more profitable and successful while looking for alternative solutions and taking risks,” reflected David. His next challenge will be to develop a new business venture that emulates nature’s own techniques for self-regulation: the mass production of bees and beneficial insects capable of eradicating infestations. In 2010 the Coca-Cola Company, EARTH University and the technical high school in the Costa Rican community of Los Chiles partnered to research sustainable orange production. An experimental plot was established within a 19 hectare orange grove owned by the high school. With EARTH University’s agronomic leadership, the hard work and commitment of the high school students, and Coca-Cola Company’s support, the research project has demonstrated Azotobacter (free-living N2-fixing bacteria) and compost applications to be effective alternatives to nitrogen fertilizers. Dr. Ernesto Brovelli, senior manager for sustainable agriculture at the Coca-Cola Company office and President of the Sustainable Agriculture Initiative (SAI), talks about his experience working with EARTH University. Why did the Coca-Cola Company decide to partner with EARTH? EARTH was a logical partner. We are concerned about global citrus sustainability and Costa Rica is becoming an important player. The Coca-Cola Company wanted the project to have a strong scientific foundation, so engaging with a local educational and research leader such as EARTH made complete sense. How does this project impact the community of Los Chiles? The impact on the community extends beyond the support provided to the school. More than building capacity, we are engaging in a two-way process where we allow the community to be part of this project by using this demo site as a center for best practices in orange production. What has been the greatest success? It is not just one but many. From a scientific point of view, results are positively impacting commercial groves. Students are thrilled with their ability to work on a research site that is an example of sustainable citrus production. And let’s not forget that as soon as fruit is available, they will be sold and the revenue will benefit the school. After this experience, would you be willing to partner with EARTH on similar projects in the future? Absolutely. I had known of EARTH for years given the connection between EARTH and the University of Florida; this experience has cemented my trust in EARTH.